We are taking on the backlash against non-recyclable plastics and are now offering the innovative Pop-Up Cup – promoted by our supplier as the World’s greenest drink packaging. Perfect for our Grab ‘n’ Go concept, this highly sustainable bottle is suitable for filling and serving chilled juices and smoothies on site, whether used for take-away or as part of meal deals. 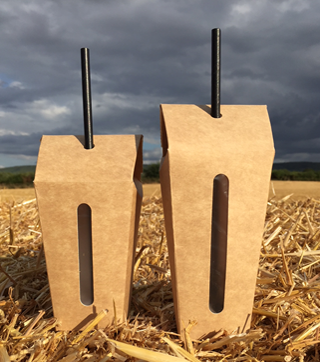 The simplicity of the Pop-Up Cup is that it is a box with a bag within, that is delivered flat and therefore takes up limited storage space. The box opens automatically by squeezing it gently on the side, then you just fill it back of house, fold the top and you're done. It is 100% leak free and when you push a paper straw through the hole in the top, this unique package is ready to use. For display purposes, the window in the front enable the drinks to be seen, whether this is for delicious freshly pressed, not from concentrate, organic juices or smoothies and super smoothies. The natural brown kraft cardboard of the outer is FSC certified and therefore very sustainable. After use, the cardboard and plastic can easily be separated, enabling each of the materials to be easily recycled. In addition, from an environmental perspective to help with the green credentials, the unopened juices and smoothies only require ambient storage (so you can maximise refrigeration space) and come in 10 litre boxes with the minimum amount of packaging compared to the equivalent in Tetra Pak cartons, which means less overall waste. Once opened the ready to drink juices and smoothies have a 30 day refrigerated shelf life, with the filled Pop-Up Cup staying fresh for up to 5 days when stored in the refrigerator. And don't forget the waste volume of the actual Pop-Up Cup packaging is also very limited.